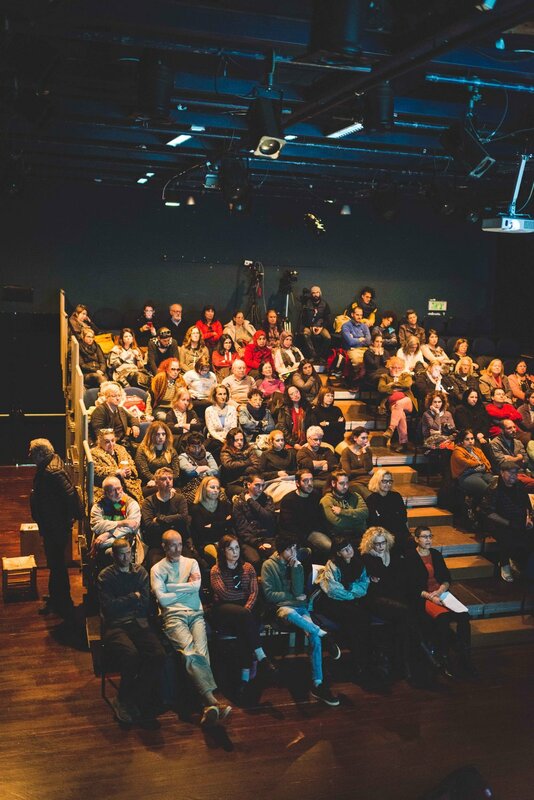 On January 15, 2019, The University of Haifa’s Department of Fine Arts held an event for Uri Katzenstein, opened by a lecture with Gilad Melzer. He is a director, screenwriter, art/book critic, exhibition curator, and cultural researcher. Gilad Melzer with an image of the sculpture "Untitled” from the Backyard exhibition at the Tel Aviv Museum in 2015. 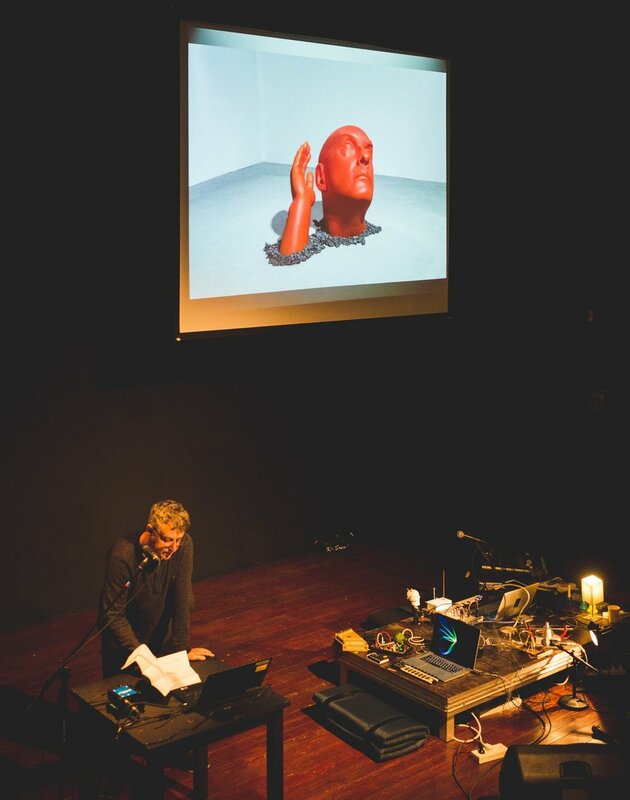 This panel includes Ohad Fishof, Yishai Adar, and Benia Reches — three musicians who collaborated with Katzenstein for many years on sound installations, art performances, and video art. Ohad Fishof is an artist and musician who creates art in a wide variety of fields, including sound, dance, video, performance and writing. He began his artistic career as the leader of the "Noseey Hamigbaat" band. Later, he went on to compose dance, performance and installations. Concurrently, he began to create art in other fields. In recent years, his work has been exhibited in Israel and Japan. He has composed and directed soundtracks for dance works in Israel and abroad. He has also published three albums, participated in several group exhibitions, and was recently chosen as an artist at the Foundation for Cultural Excellence. He teaches at Beit Berl College and Bezale Academy of Art and Design. 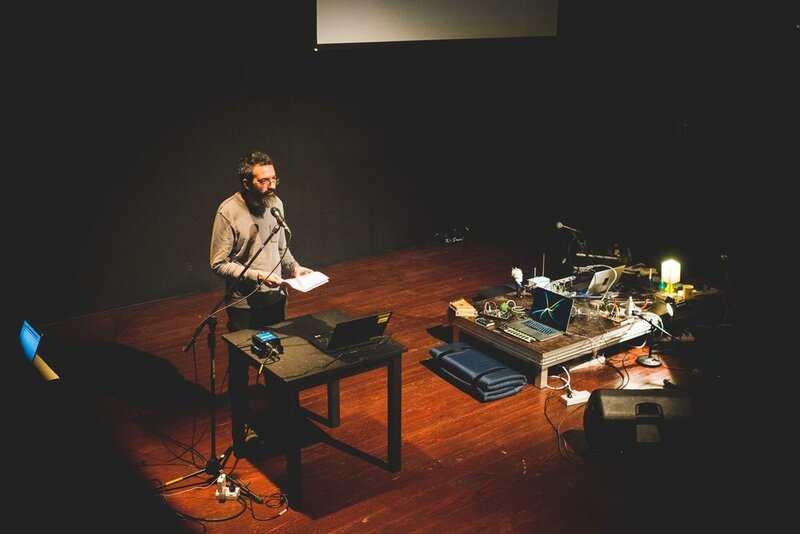 Yishai Adar, a composer of soundtracks for the cinema, is a sound designer for interfaces and video works, an independent musician, a partner in the "Bnei Hama" group, and one of the founders of the "Noseey Hamigbaat" band with Ohad Fishof. Featured in many newspapers, he is a soundtrack lecturer at the Sam Spiegel Film and Television School, and a lecturer and head of the track for music and sound at the Sapir College of Sound and Screen Arts. He recently won the Best Music Award at the American Forum of Documentary Creators. 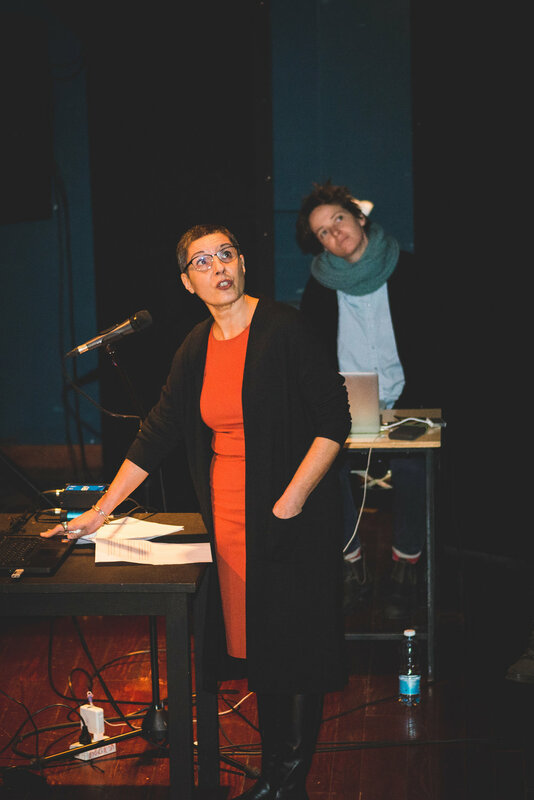 Benia Reches is a musician, sound designer and sound technician, with whom Uri collaborated on many sound and video art works. He also worked with him on exhibitions including the Israeli Pavilion at the Venice Biennale in 2001. Ohad Fishof, Yishai Adar, and Benia Reches and on the screen the performance video of “Panta Rai” in the background. Uri Katzenstein performed in the ensemble "Panta Rai" with Yossi Lederman of blessed memory, at the Roxanne Club in Tel Aviv in 1991. Sergio Edelsztein, founder and director of The Artifact Gallery in Tel Aviv, established the Center for Contemporary Art in Tel Aviv (CCA) and curated and directed it for 20 years. Within the framework of the Center for Contemporary Art, he also curated 7 International Performances Biennale (Nullification), and 5 International Video Art Conventions (VideoZone). In addition, he curated exhibitions and conducted performance events, video art and experimental film programs in Israel and abroad. He initiated and directed the Video Art and Experimental Film Fund at the Center for Contemporary Art. With the support of the Film Council, he later initiated and directed the curatorial studies program at Kibbutzim College, where he serves as lecturer. He has been published in many articles, websites, and magazines in Israel and abroad. 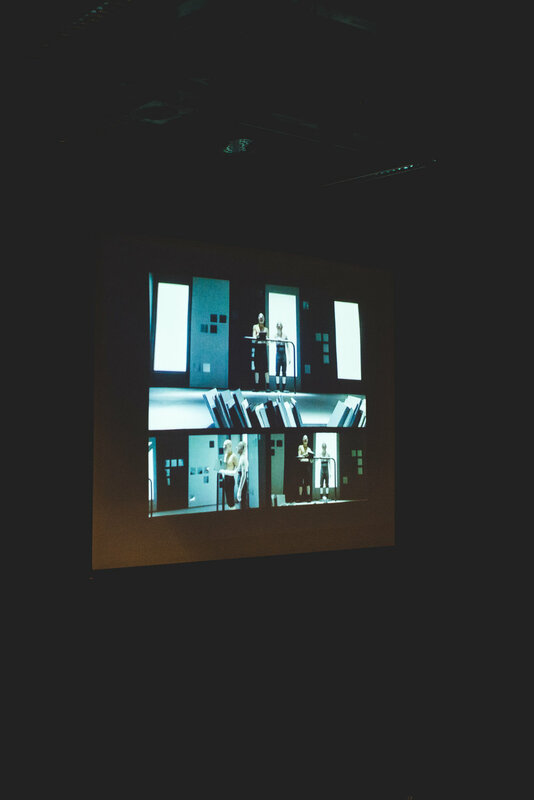 Edelsztein has exhibited many of Uri's video art works over the years. 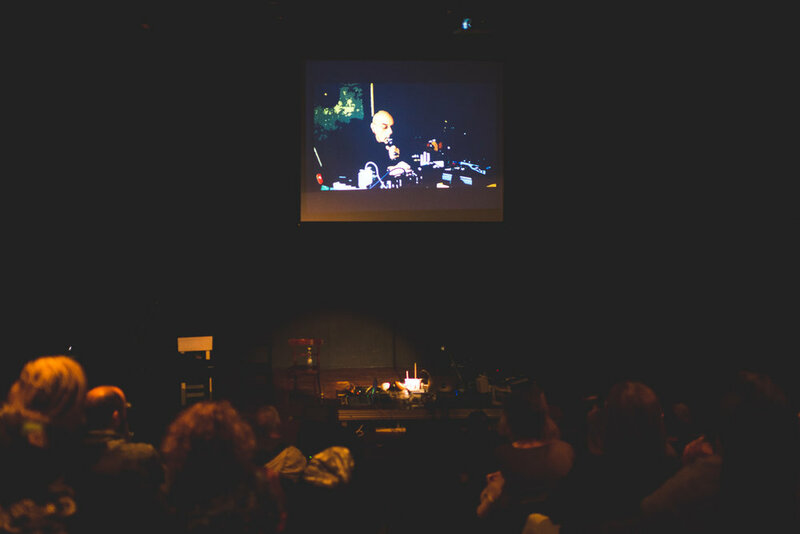 In the background is a screening of Uri's video art, "Family of Brothers" from 1999. Gilad Melzer, pictured here, with a detail from Uri’s artwork on display in the background. The image you see is a tattoo of the sculpture "The Climber" on the shoulder of curator, Naomi Aviv. Uri's artwork was shown at the 1st Biennale of Sculpture in 1990 at Ein Hod, curated by Naomi Aviv of blessed memory. The work in the Biennale included 12 needles of tattoos, tattooed on 12 people. Uri gathered the needles and placed them in the niche of an olive tree.